Cheryl Blitman got a horrible shock when she opened her cell-phone bill. It was $170 higher than usual. Her phone company told her that her daughter had subscribed to 17 premium texting services. But Michelle, 15, was adamant; she had not. Eventually they figured out the source of the charges: FarmVille. FarmVille is the most popular game on Facebook  65 million unique monthly players and growing. It is also the furthest place imaginable from the seedy underbelly of the Internet. It's a hamlet where the sun always shines, crops always grow and your friends drop by to do chores accompanied by plinky guitar music. Its astonishing popularity is a testament to the potential of gaming on social networks. Social games promise the golden pork-chop combo of the addictiveness of computer games with the communality of Facebook and MySpace. And they generate some of their revenue from product come-ons, which is where Michelle  and FarmVille's owners  has run into trouble. FarmVille is part of Zynga, the fastest-growing, most buzzed-about social-game company of the moment. In October, Zynga operated six of the 10 most popular Facebook games: FarmVille, Cafe World, Mafia Wars, YoVille, zyngapoker and Roller Coaster Kingdom. 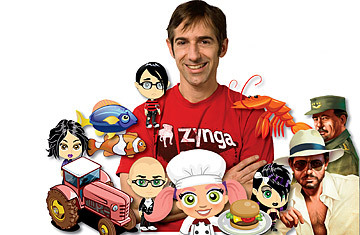 Founded in July 2007 by Mark Pincus, 43, Zynga had 45 staffers by June 2008 and now employs 600, counting contractors. Its most recently launched game, FishVille, hooked 9 million users in a week. Zynga is privately held, but a rival less than half its size was recently bought by Electronic Arts, the GM of games, for $400 million. How could an outfit that offers scammy mobile-phone horoscope subscriptions get so popular? To figure that out, we have a useful analogy close at hand: FarmVille. There are two ways to move ahead in the game. One is to grind, as it's known  plow, plant and harvest. Once you've grown, say, eggplant, you accumulate enough points to move up to a wider choice of crops. You invite friends to be your neighbors. You exchange gifts and help out, all of which let you accrue the capital you need to expand your farm, thus making it ever more remunerative. But if you want to skip all that backbreaking plowing, er, clicking, or if you've run out of friends who faux-farm, you can buy farm cash and get what you want. These virtual goods are the products that social games are actually trying to hawk. People hand over real money for make-believe merchandise. It's like using greenbacks to buy Monopoly dollars  but if you want to win, you'll pay up. Starting a social-gaming company is also a grind. You have to do a million little things to get ahead. Industry watchers credit Zynga with figuring out hooks for its games that make people want to revisit  a combination of shrewdly timed rewards, incentives and opportunities to play with friends. Pincus calls these the "golden mechanics." He learned them by trial and error, mainly while working on his two failed start-ups, Tribe.net and Supportsoft. He also has a behavioral psychologist on staff. Unlike traditional electronic games, which can't be changed much after they're shipped, Zynga's games constantly evolve in response to users' preferences, so they're more habit-forming. "They're making movies," he says of console-based-game creators. "What we're doing is more like weekly TV programming."